Posted in Family life, Self-awareness and tagged as cancer, centering, Glennon Melton, God, love, motto, prayer, Signs of Love, we can do hard things. Thank you for your response. My friend’s diagnosis has hit so close to home, because we walk the same path every day. I am sure you inspire your friends in the same way. You inspire me for sure. I can do hard things too! Love it Ali. I will use your sentence many times in the next year. Keep them coming. You have such a great gift of speaking truth and inspiring people through your vulnerability. Thank you for helping us keep things in perspective. What a wonderful story Bev and I am so glad that your mother overcame her diagnosis and that you were able to walk through life together for many more years. I appreciate my time with my mother each and every time I see her. Her life is a gift to me! Thank you for commenting. I love hearing other people’s stories! Ali, thank you for this beautiful story. I just love the way you write. I have now 3 people in my circle of friends dealing with breast cancer. Your words are an inspiration and I will pass them along with hope and love to those challenged with this disease. Thank you again. Thanks Annie for reading and for sharing what I hope is an encouraging message. I know how easy I can get down on ‘what is’, when I really need to celebrate it. I will lift up all your friends in my prayers as well as Genni. Ali – this is so beautiful and timely. Travis’ (at the ranch) wife was rushed to the hospital yesterday. Operated on today with a 10% survival rate. Travis, with a special needs child and a 7 month old put the kids in the car and drove in a snow storm 1 1/2 hours today to be with her. She made it through surgery. Will have another one in a day or two. Improved to 40% survival. Family is on their way. I will share this with him in a few days. He is strong, he will make it through all of this too, hopefully with his Melissa. You have an amazing perspective on life and we can all learn a lot from you, thank you for opening your heart and our eyes and ears! Cheers. Thanks for sharing what is going on in your heart right now – who you love and what is hard for them. I will lift them up as well and keep them in mind when i think about what is hard. I so appreciate the feedback and the community we can build when we share our stories. A dear friend shared this on her FB page and I am so glad she did. My niece will turn 21 in the next few weeks. She is beautiful, vibrant, funny, quirky, loving, smart, and cancer-free. At 16 she was diagnosed with leukemia and endured a fight we never could’ve possibly imagined. She did indescribably hard things with a steady and certain grace – an unshakable center that, despite all that whirled around her, would not be moved. So the night she was diagnosed, laying there in the bed receiving her first chemo treatment, she and I talked of many things. Among them was how we always wanted to go to Paris. Well, one week from tomorrow we leave for that trip! To traipse through cafes and museums and places we dreamed of…to go wherever we want. And that is a celebration that I feel might just make my heart explode. This post…blessed me so very much. Thank you. What a celebration and a miracle! I am so glad to hear that your niece made it and that you are the kind of aunt who is taking her to celebrate! That is exactly who I want to be as an aunt as well – someone who loves whole-heartedly! Have a wonderful time. I know you will soak up each and every moment of joy and life. So beautifully said. Thank you. I too am filled with love/worry/prayers for our mutual friend, and all who struggle with truly HARD challenges. Challenges like these bring growth to everyone they touch. When my 25-year-old nephew died of lymphoma he taught all of us a lesson in dying with dignity. He also drove home a lesson in honest communication and loving commitment. When my youngest brother put aside his life for a month last summer and suffered in silence through the stem cell harvesting process that saved my eldest brother’s life, our already strong family unity moved to a previously unimagined level. You are so right. 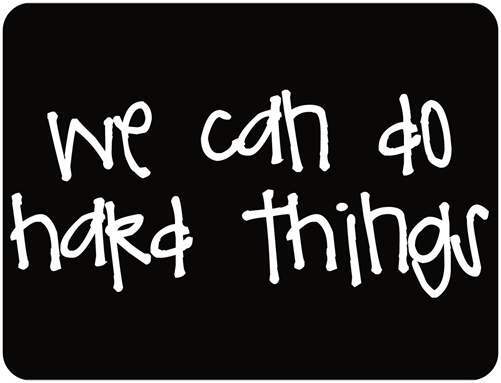 We CAN do hard things. Working on them together betters us all. Thank you for sharing your insight. I’m glad this came into my facebook stream. I’ll have to keep an eye on your blog now. I am so glad you have had a similar experience of hardship bringing unity and love to your family. It is so much better to stick together, instead of allowing things to tear us apart. Thanks for reading and taking the time to respond.